Totes & Bags > Doggie Bags! Doggie Bags! 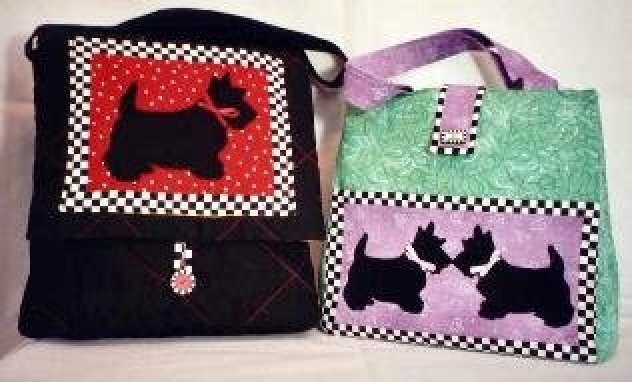 You'll fall in love with the cute Scottie Dog appliques on a roomy Shoulder Satchel (9"x10"x2 1/2") and an adorable Mini Tote (9"x9"x4"). Contrasting linings and plenty of pockets make these Doggie Bags practical as well as pretty. Pattern includes both bags. KIT for Shoulder Satchel includes pattern for both bags, one handmade round red button and fabrics for the black bag and lining. KIT for Mini Tote includes pattern for both bags, one rectangular dog bone button and similar fabrics for the tote and lining. Kits do not include notions required to finish the project. Handmade BUTTONS available: round red with black and white border OR rectangular dog bone with heart.